In a separate terrace, the whole Café and Restaurant is definitely the soul of Camping and his most important social center. The cafe has huge windows from which you can contemplate the pool side and the other playground. In the cooler months, the warmth of the wood burning fireplace invites you to socialize around the fire. We have adapted the cafe and restaurant service the needs of our campsite, we have takeaway meals, catering available for groups, but also snacks, meals, pizzas and what more you can wish. Mind you, if you want a sophisticated dish or five star menu we also offer many years of experience behind us. In front of the cafe, surrounded by a beautiful green area with plenty of shade, the ideal place to relax and give in to the sun. The pool is not too deep, from 100 cm to 150 cm, so everyone, young and old, can enjoy the facility of Camp Lake Resort. Stay tuned, these dimensions do not need the pool lifeguard and small children should not be alone. Across the cafeteria, Children’s Park is a large space where kids can run, jump and play at ease. Logically there can not access vehicles. We have slides, swings and games for young and old. No, not really a supermarket is a supermarket. Still, our shop has nothing to envy the large supermarkets. We have everything needed for daily consumption, oil, salt, sugar, preserves, pickles and confectionery industries. Fresh drinks, bread, ice cream ... can we ask for? So yeah, a space dedicated to material Camping more necessary: picks, winds, masts and also a Fisherman’s Corner, with thread, mosquito bait. 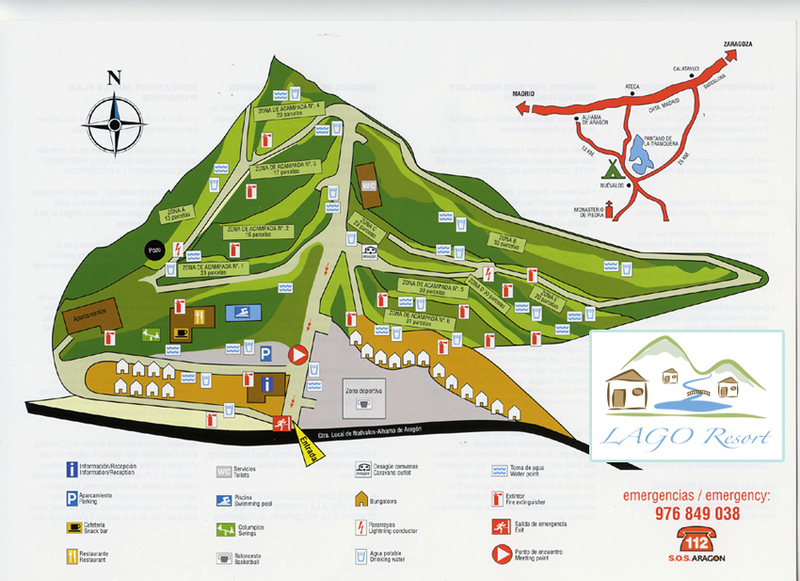 It is indeed a Supermarket Camping Lago Resort. The lounge is our favorite space. Space is very advantage and multipurpose: there we have a space for children in the cold days, with a pool of small balls and we complete love with room with board games and stories. We also have our small library, book exchange area where you can get the book that you like and where you let just ask you another in return. A mini projector cinema where films usually put children and finally a space that serves as a "dining" collective, here you can make a fire in the grill, prepare your food to your meals and table talks with the only limitations do not disturb and leave all the best collected possible. There are dishes and utensils for your use. The service building is open all day. It has free hot showers, sink, toilet, washing machine and dryer, sinks and laundries. Everything you need for life on theCampsite.